Eric Maxwell Johnson was born on the 15th September 1979, in Needham, Massachusetts USA. He is a former professional football player, who played in the teams of the San Francisco 49ers and New Orleans Saints of the NFL in the position of tight end. Eric Johnson accumulated his net worth playing football professionally from 2001 to 2008. How much is the Eric Johnson’s net worth? Reportedly, the overall size of Eric Johnson’s wealth stands at $100,000, the main source of his net worth career coming from his football. To begin with, Eric Johnson was born and raised in Needham, Massachusetts. He studied at Needham High School as well as Belmont Hill School where he began his career on the football field. 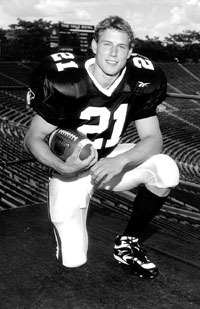 Eric continued playing while studying at Yale University; during his college career Johnson played in the position of wide receiver with the statistics in one game of 21 receptions for 244 yards in the victory against Harvard University in 1999. After a successful college career, the player was drafted 224th in the 7th round of the NFL draft in 2001 by the team of San Francisco 49ers. Eric Johnson played under the number 82, and the position of the player was changed to the tight end. Being 1.91 m height and 114kg of weight he was perfectly suited for the previously mentioned position. Thus, he began his professional career that increased the total size of Eric Johnson’s net worth as well as being the source of his popularity. The statistics of the NFL reveals the information that the professional player Eric Johnson has made 240 receptions for 2,178 yards and made 9 touchdowns during his career. He was a valuable player in the very beginning of his career, but unfortunately he suffered injury and missed the whole season of 2003. After a long rehabilitation, he successfully returned to leading the team of San Francisco 49ers with 82 catches for 825 yards and making two touchdowns. However, the season of 2005 was missed because of injury, and in the season of 2006, he had to share playing time with another tight end Vernon Davis. In 2007, Eric signed a contract for a year with the NFL team New Orleans Saints. In 2008, he re-signed with the same team but he was released during the same season. Thus, the career of Eric Johnson, that added considerable sums to his net worth, was ended. Finally, in the personal life of the former football player, he married his first wife Keri Johnson in 2005; however, they divorced soon after, although the date when their divorce was finalized remains unclear. In 2010, Eric Johnson fell in love with the singer Jessica Simpson and the two began dating. The same year the couple announced their engaged. Their first daughter was born in 2012, and their second child in 2013. In 2014, the two married at the San Ysidro Ranch, in Montecito, Santa Barbara County, California. 1 Son, Ace Knute Johnson, was born on June 30, 2013. 2 Friend of fellow San Francisco 49ers player, Chris Hetherington. 3 (November 28, 2012) Eric and Jessica Simpson are expecting their second child. 4 Daughter, Maxwell Drew Johnson, was born on May 1, 2012, in Los Angeles. 5 (October 31, 2011) Eric and Jessica Simpson are expecting their first child. 6 Played tight-end for the San Francisco 49ers and New Orleans Saints. 7 (November 14, 2010) Engaged to Jessica Simpson. 8 He played college football at Yale. He was an academic All-American. 9 He was drafted by the San Francisco 49ers in the seventh round of the 2001 NFL Draft.